What's this? 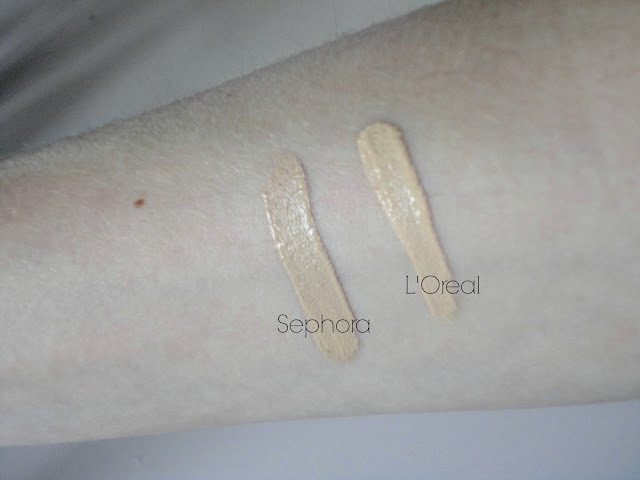 I thought I'd do a little joint review today of some new concealers I've been trying: the Sephora Bright Future Gel Serum Concealer and the L'Oreal True Match concealer. I'd heard about the Sephora one from Katy (Lustrelux on Youtube), and picked it up when I was in Sephora in January. I got the shade 20.Creme, and they have 20 shades which is a great selection! I think the European shades might be a bit different to the US site, as on the website 20 is the darkest shade, which mine definitely isn't! I'd say on the US site, mine would probably be 01,02 or 03. For the L'Oreal one, I got the shade 2 Vanilla. They only have 5 shades in this range, so not as good of a selection. Where do I get it? The Sephora one is obviously available at Sephora only (link here) for $14, and the L'Oreal one is available here for £6.99. Swatches? I have side by side swatches of the two below. The Pros... I'll start with the Sephora one. Firstly, the colour is absolutely perfect for me. It has a very neutral undertone so works for everywhere on the face. It is fairly high coverage for a cream concealer and I really like the doe foot applicator. It blends out really nicely using both a brush or a Beauty Blender, and has fantastic staying power. I find this is also really great for covering blemishes. For the L'Oreal one, this is definitely more suited to highlighting, as it has a very yellow undertone. The colour is absolutely lovely for highlighting under the eyes, down the nose etc, and is a great cheaper concealer for anyone who loves having a really bright undereye. I do really like it - I'd say it has a medium coverage (less than the Sephora one but still gives good coverage), and blends out nicely. The Cons... For the Sephora one, I'd say the only con is that is is much less accessible for us lot in the UK, and if ordering online, you are taking a bit of a risk with colour matching! But other than that, it's a lovely concealer, so if you can get your hands on it, I'd highly recommend it! As it has a neutral undertone, this won't brighten as much as the yellow toned L'Oreal one will, but I still like to use it under the eye for day-to-day. The L'Oreal applicator is slightly annoying as it doesn't really dispense much product, meaning I have to keep dipping into the tube to apply more. I don't think I'm particularly heavy handed with concealer either, so I think it's really just the applicator itself. My only other con with this one is that it isn't really one to use on blemishes or to cover anything, as I find it's definitely more of a highlighting concealer. What do you think? 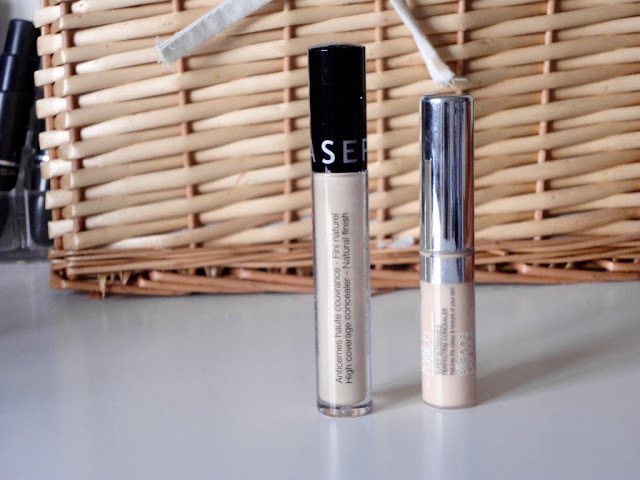 Let me know if you've tried either of these concealers, and what your thoughts are in the comments below!